Every region of North America hosts some form of cabbage looper. The caterpillar doesn't have legs in the middle of its body so moves like an inchworm, with a "looping" motion. The larvae of a gray, night-flying moth, the looper chews ragged holes in the leaves of cabbages, broccoli, Brussels sprouts, and cauliflower. Later in the season, it bores into developing heads. There may be several generations per year. Use a lightweight row cover in early spring as a barrier to egg-laying moths. Spray with Bacillus thuringiensis (Bt), which is most effective when catepillars are small. 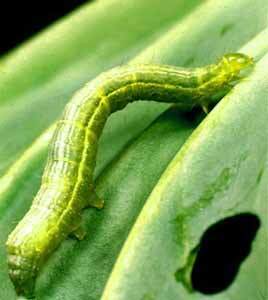 Be sure to spray the undersides of leaves where young caterpillars prefer to feed.